I have filmed a flip-through of my finished Christmas Journal, that is in a Traveler’s Notebook regular size insert that I made myself. I have also edited it and uploaded it, and for that I am very proud. It’s this years first video and my aim is about 30-40 more this year! I’ve journaled on the last couple of pages of the Christmas journal, and printed a few more photos for it. I feel that it’s full to the brim, and finished. I can not add anything more to it, or it will burst, so it’s time to archive it. Shelf it. Say good bye and move on. It’s a keep-sake and rather personal, but now it’s time to move on. But before I put it away I wanted to film a “quick flip-through” for you guys! Sorry if it feels a bit boring to go back to Christmas stuff in January (with this blog post + a video), but I hope you are not too tired of it, even though I’ve shared two process videos about it already. But that’s just it. With the first video being of a finished insert that was almost bare, I felt I wanted to do a final video of the filled journal. I’m crazy like that you know. I love notebooks, but filled journals are just so much better, right? If you are not subscribed, you might have missed the previous videos/post about this particular journal. Feel free to check them out before you watch the final video, to see some of the process as I filled it. 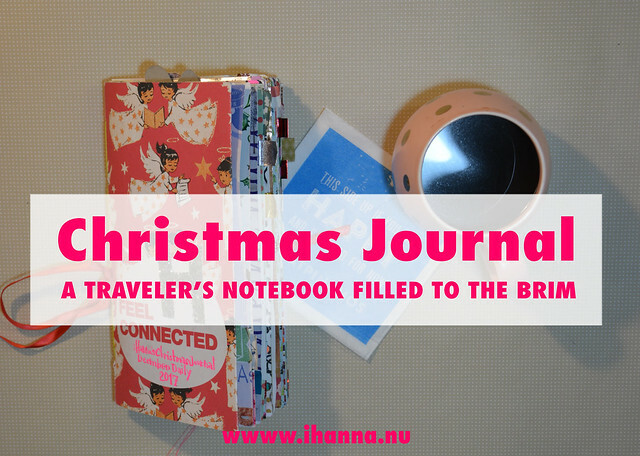 If you can’t see the video above click here: Traveler’s Notebook FINISHED Christmas Journal to see it on YouTube. I hope you will subscribe if you haven’t already, that means a lot to me. 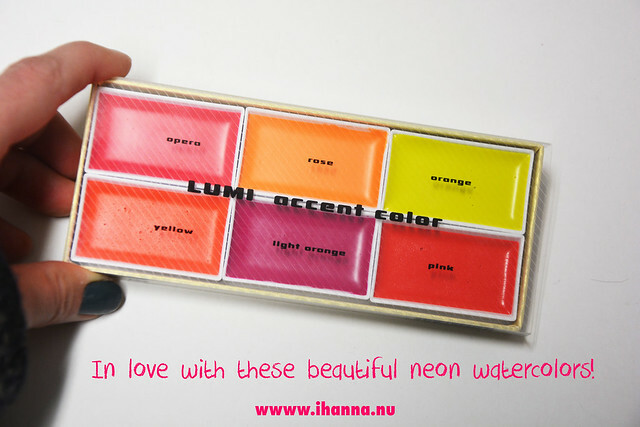 In the video I show my neon watercolors that I got on Amazon, called KISSHO GANSAI Japanese Watercolor Paint, it’s LUMI Accent 6 Colors Set (affiliate link). I haven’t really played with them enough to write a review, but let me know if you’d be interested. So far though I can say that they are truly neon watercolors and that alone feels amazing to me. I’ve been craving more neon colors for too long! I will be playing with them in my art journal next, I’m sure. I hope you are reconnecting with yours this week. 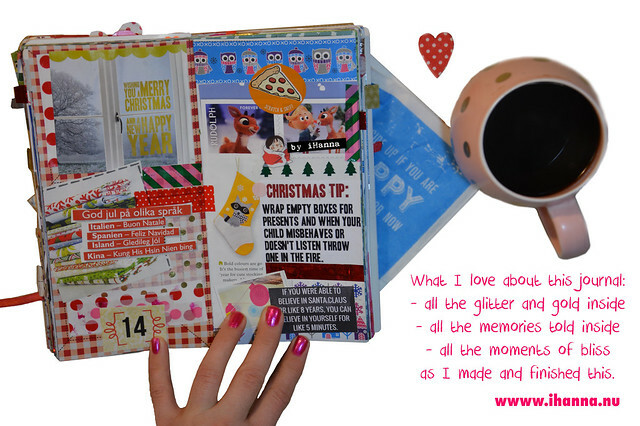 Have you ever made a Christmas Journal or something similar for a special occasion? This entry was posted in A Creative Life, Notebooks and tagged christmas journal, flip through video, memory keeping, neon colors, traveler's notebook, video by me. Bookmark the permalink. So sorry that you lost your journal Irma, that’s horrible! I hope you can create a new journal, even though it’s not a December one. Keep writing & creating, even if it’s not as easy now. Your journal turned out so cute!! Thank you so much for sharing the finished product with us! It’s been fun to see it from start to midway to complete! Thanks Arielle, glad you took the time to watch it, so I could share it with you. Journaling is a bit lonely, but these videos makes it feel at least a little bit more like you’re there with me.